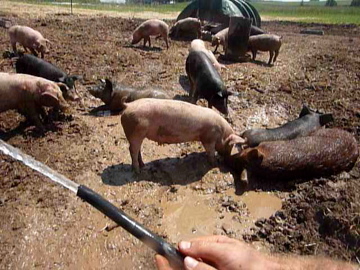 Nothing says a hot summer day like watering the pigs… They love it. They try to drink the water as it comes out of the hose, they play in it and love to have it hit their ears. If you’ve never seen a pig wallowing in a mud, you’re missing out on one of the simplest joys in life. The pigs on our farm are outside on pasture for the duration of their lives on the farm with us. We move them every week after they have rooted up everything, eaten it all and trodden their waste into the soil. The section of pasture we had them on, was an area that had been garden, but was in a rest year. Our hope being that they would nibble on all of the twitch, vetch and thistle roots, providing us with a better weeded patch of land for future gardening use. Our pigs are generally York and Berkshire, but this year we also had a Red Wattle, which I am now completely sold on as a breed. 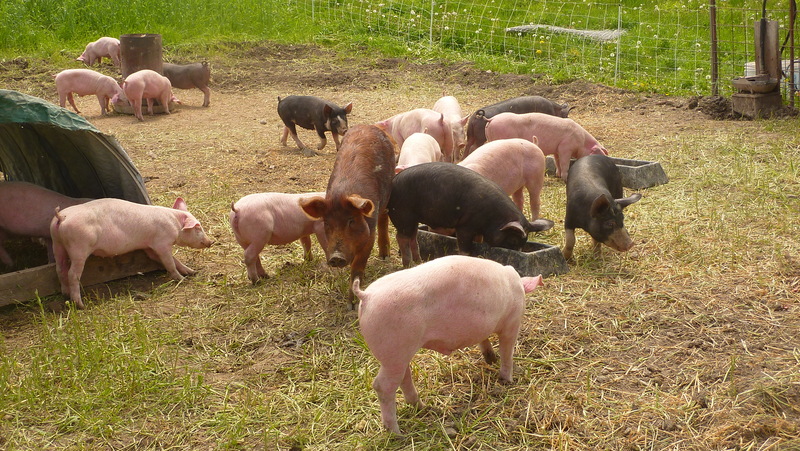 We keep our pigs in their outside pasture by using electric fencing. Initially we had the electric netting with an interior wire to keep them from rooting dirt up onto the bottom of the electric netting and shorting it out, but after a few weeks they were well enough trained that we didn’t need to put in the interior wire. You might not think of it but pigs, especially York pigs, are susceptible to sunburns. 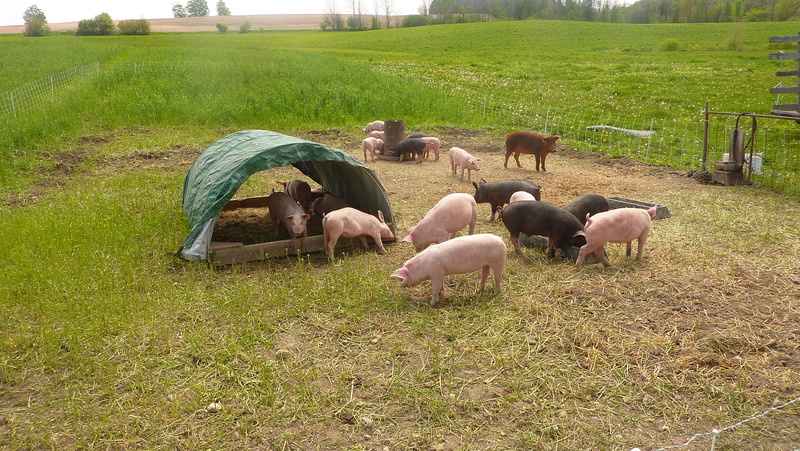 So, in order to keep them cool, shaded and happy, we build this awesome pig shelter. In order to bend the poles, we had to get a new toy (shucks) called a poll bender, that you can use to bend polls for mini-hoop houses and shelters. The pigs loved theirs, really roughly, and so occasionally we had to reinforce or replace the polls to keep it going. But… it was light weight so that we could just pick it up with 2 people and move it each time we gave them a new section of pasture. ~ by mcquaka on May 19, 2012.